Uh-oh... I’m watching the Celtics again. Yes, the Celtics; and yes, the basketball team. There is a football club based in Glasgow called Celtic, without the ‘s.’ But I support its city rival Rangers, instead. To get back to the Celtics, or the Boston Celtics, please pull your eyebrows down because I do have a favourite basketball team. As everyone knows, I am not particularly fond of basketball. However, when I was growing up, my Dad watched the Celtics; my older brother watched the Celtics; and since we only had one television set and hopping channels was never an option, I invariably ended up watching the Celtics as well. Those were the days when Dave Cowens at a mere 6’ 9” played at center and duelled against Kareem Abdul Jabbar. Initially, Jabbar was with the Bucks but was subsequently traded to LA. That is why, to this day, I am still allergic to these two franchises. Then there was John Havlicek, whose shooting from the outside was unbelievable. There was also Danny Ainge, who played minor league baseball in the off-season. 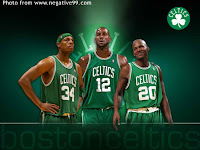 In a way, the Celtics were like the Liverpool of basketball. Their successes just went on and on. When their legends retired, they always seemed to be able to find just the right replacements to not only blend in seamlessly with whoever was left behind but also continue the club’s tradition of winning. These players ultimately became household names as the Boston Garden further cemented its reputation as the Anfield of basketball. Robert Parrish, Dennis Johnson, Bill Walton and Larry Bird to name a few. For a longer list, call Erick Martinez. He’s the basketball fan, not me! Don’t call Bong Cubilla. He’s a Lakers fan. That franchise will be like the Manchester United of basketball. In other words, the enemy! At any rate, I always thought it not just a tad curious that the Celtics’ decline in fortunes more or less coincided with the similar decline of my favourite football club across the pond. So I stopped watching the Celtics. And yes, I was not watching Liverpool, either; but that was because I did not have cable yet. When I finally had cable installed, I watched Liverpool whether they won or lost. But I did not watch the Celtics because there were years when they were so poor that they sometimes propped up the rest of the table. I can bear watching Liverpool lose because I’m a life-long supporter of the club and a fan of the game. Since I was never seriously a basketball fan, I always felt that I was not obligated to watch my favourite team being trampled upon like a doormat. Then, a few years back, the Celtics regained a sense of ambition and acquired Kevin Garnett, Ray Allen and who else Erickson? There was a buzz around the Garden as the Celtics strutted their way to a first title after what had seemed like an eternity. Of course, I resumed watching the Celtics. Superstitious that I can be, and thinking for some reason that the fortunes of the basketball club was somehow linked to that of my football club across the Atlantic, I silently crossed my fingers and wondered if the Celtics’ winning the championship was portentous of good things to come in Liverpool. Silly me! Of course Liverpool continues to wallow under the shadows of the Manchester and London clubs; while the Celtics themselves for one reason or another failed to restore the dynasty that I hoped they would. So I stopped watching the Celtics again. Frankly, the only occasion when I watched the NBA this season was when those damn fool former colleagues of mine who are all basketball fans came over to the house for a few pints. Oh, I would check the standings in the Internet every now and again; but at no point in the entire season did the tables appear to hint that the Celtics were championship material. Too old, many often say. Besides, the other franchises had caught up with them. There was a bit of a novelty, perhaps, to the Celtics making the Conference finals against the Heat. But who really gave them a chance? When the Heat quickly made full use of home advantage to build a 2-0 lead, I quietly hoped that the series would not be a sweep. Game 3 and I learned from my Facebook NewsFeed that the Celtics had managed to win. At least, I thought to myself, the embarrassment of losing by a sweep had been hurdled. I, of little faith. I had no plans to watch Game 4; but the Celtics fans kept the rah-rah spirit going on the NewsFeed. So I turned the television on to see the Celtics flirt with fire before putting the Heat to bed. 2-2! And I’m watching the Celtics again! Naturally, I didn’t need the NewsFeed to get me to turn on the TV for Game 5. All I can say is the Heat got cold; verrrrrrry cold. The series is now 3-2 in favour of the Celtics, who are just a win away from glory!